Alberta needs a complete system of protected areas that captures the province’s diverse Natural Regions and the species at risk that live within them. Wild Spaces 2020 is our call for action by the Government of Alberta to fulfill their commitment to protect 17 percent of Alberta’s landscape by 2020. 17 percent protection was the commitment made by the Canadian Federal government at the Convention on Biological Diversity in 2010, from which Canada Target 1 was set. 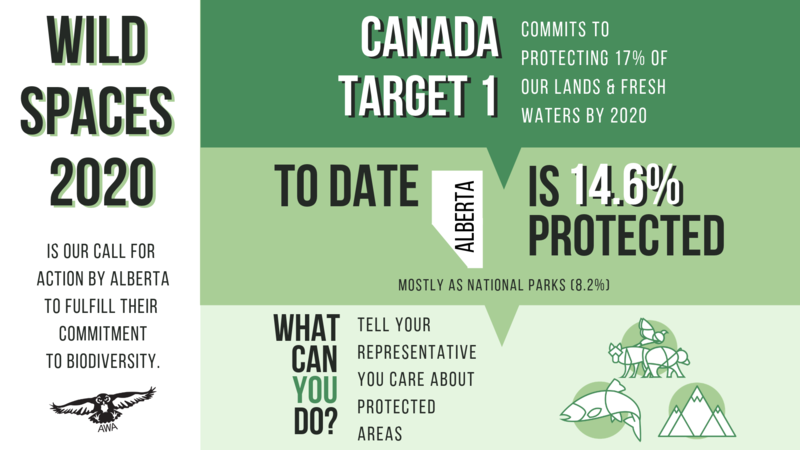 As of June 2018, 14.6 percent of Alberta is protected: 8.2 percent as National Parks and 6.4 percent as provincial protected areas. To date, the Government of Alberta has not released plans for achieving 17 percent protection by 2020. 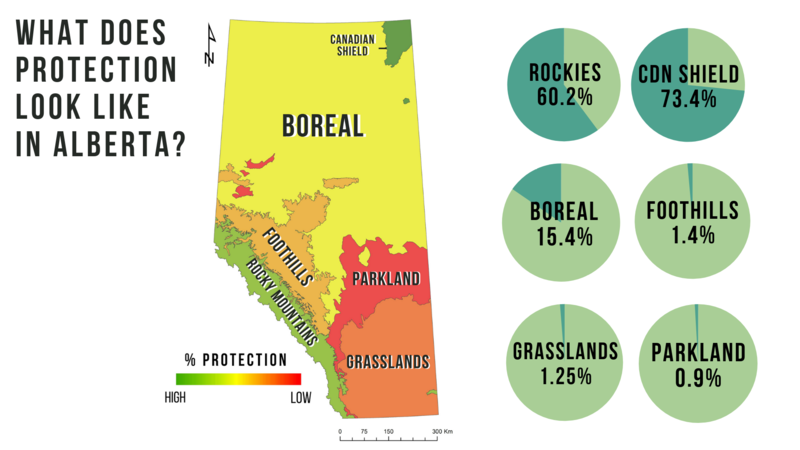 While some of Alberta’s Natural Regions are relatively well protected, others including Grasslands, Parkland and Foothills are poorly represented in the current protected areas network. A lack of representative protection has led to declines in species habitat and biodiversity. AWA is asking the provincial government to continue moving forward with their commitment. You can help by sending a letter of support to your local representatives, letting them know you care about protected areas in Alberta. This commitment was made under the United Nations’ Convention on Biological Diversity, held in Aichi, Japan in 2010. In keeping with this national and international commitment, the Government of Alberta has also committed to protecting 17 percent of Alberta’s landscape. 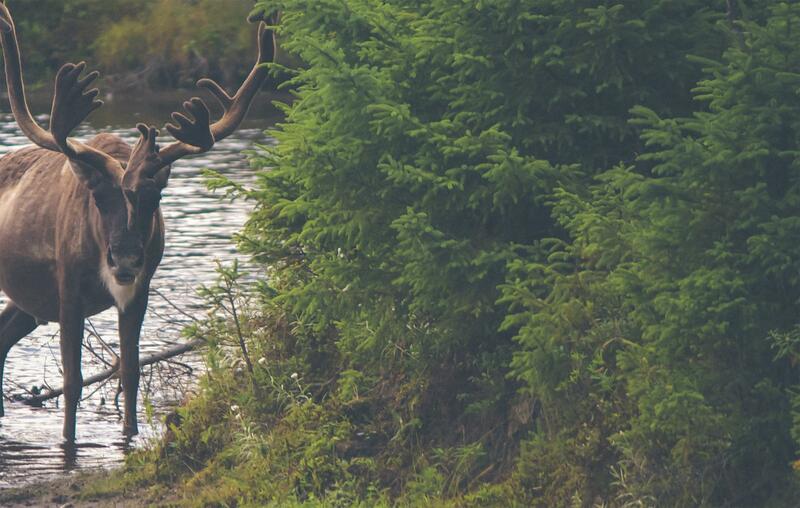 In order to meet the Canada Target 1, protected area systems must protect each Natural Region, include areas of particular importance for biodiversity and ecosystems, and be well-connected. Many provincial protected areas are small and isolated within a highly developed landscape. These areas will not support wildlife, viable ecosystems, or landscape-scale natural disturbances over time. Some protected areas allow industrial development, undermining the value of their protection. From our mountains, to boreal forests and grasslands, Alberta has an amazing number of wild spaces that we cherish and take pride in. Unfortunately, many of these areas are not protected and are at risk of being lost. Healthy, protected ecosystems provide us with food, clean water, safeguards from natural disaster, recreation opportunities and economic benefits. Throughout the years, AWA has identified important landscapes containing key features, and rare or special landscapes. We have worked to maintain the ecological integrity of these areas, keeping them wild. Some of these Wild Spaces are essential, containing regions and ecosystems that have not yet been protected, and that require protection to complete the provincial protected areas network and sustain biodiversity in our province. Other Wild Spaces may function as corridors or transition zones for species between protected areas. Many Wild Spaces require sound management for working landscapes, where economic development can be sustainably integrated with conservation objectives. See our Wild Alberta map to explore current protected areas (green) and areas AWA has identified for completing Alberta’s protected areas network (gold). A complete protected areas network includes representation of all Natural Regions, landscape features, and rare and special landscapes. Core areas need to be set aside as the foundation of the system. These must be large, natural, and interconnected. Corridors are needed to provide connections among the cores. These must allow for the movement of wildlife and natural processes. Buffer zones should surround the cores to insulate them from the negative effects of nearby development. Working landscapes throughout the province should incorporate management objectives for the maintenance of natural values. Because protected areas alone are not enough, environmental protection should be at the forefront of all land-use planning initiatives. Free, prior and informed consent of Indigenous peoples in the creation and management of protected areas provides inherent value as well as significant opportunities to meet conservation objectives. We must uphold reconciliation commitments and meet Target 18 under the Aichi Biodiversity Targets, so that “traditional knowledge, innovations and practices of indigenous and local communities relevant for the conservation and sustainable use of biodiversity, and their customary use of biological resources are respected, subject to national legislation and relevant international obligations, and fully integrated and reflected in the implementation of the Convention with the full and effective participation of indigenous and local communities, at all relevant levels”. It is appropriate for government to be the primary responsible body for achieving Aichi Target 11; however, Other Effective Conservation Measures (OECMs) such as private land conservation easements can play an important role in complementing and enhancing government established protected areas network, provided they meet IUCN protection requirements for OECMs. Indigenous Protected and Conserved Areas (IPCAs) will also play a central role in the completion of Alberta’s protected areas network. Alberta has an amazing diversity of natural landscapes ranging from mountains to grasslands, boreal forests to wetlands. Healthy, protected ecosystems provide us with many services such as food, clean water, protection from natural disasters, and recreation opportunities. Protected areas provide direct and indirect benefits to overall physical and mental health (Equilibrium Research 2010; Sturm and Cohen 2014). Alberta contains protected areas which fall under federal and provincial jurisdiction. 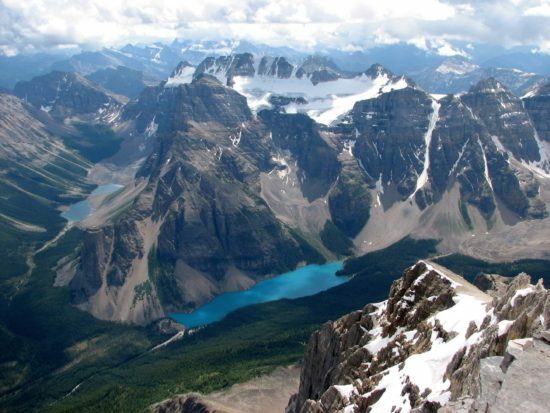 National Parks – From Banff, Jasper, Waterton Lakes, Elk Island to Wood Buffalo, some of Alberta’s largest and most iconic protected areas are National Parks. Under the Canada National Parks Act, National Parks are established for “the benefit, education and enjoyments” of Canadians and must be managed in a way that leaves them intact for future generations. National Wildlife Areas –Under the Canada Wildlife Act, National Wildlife Areas are “created and managed for the purposes of wildlife conservation, research, and interpretation.” Most are relatively small with the exception of Canadian Forces Base (CFB) Suffield NWA, which is significant for its protection of native prairie. Migratory Bird Sanctuaries – These can be established on private, provincial, territorial and federally owned land to protect and conserve migratory birds, both as populations and individuals including nests; Environment and Climate Change Canada are responsible for the protection of migratory birds and their nests. They are established under the Migratory Birds Convention Act. 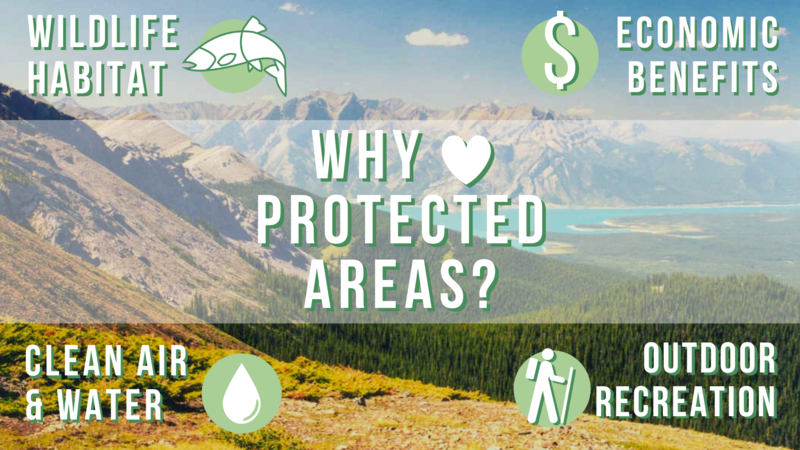 The term protected area is used in Alberta to cover eight distinct designations covered by three different legislative acts: the Provincial Parks Act; the Wilderness Areas, Ecological Reserves, Natural Areas and Heritage Rangelands Act; and the Willmore Wilderness Park Act. Ecological Reserve – An ecosystem containing representative, rare and fragile landscapes, plants, animals, and geological features that is protected for scientific research, education, and heritage appreciation. They are established with the strict intent to preserve natural ecosystems, habitats and features, and associated biodiversity. Surface disturbance is not allowed within an Ecological Reserve and can only be accessed by foot. 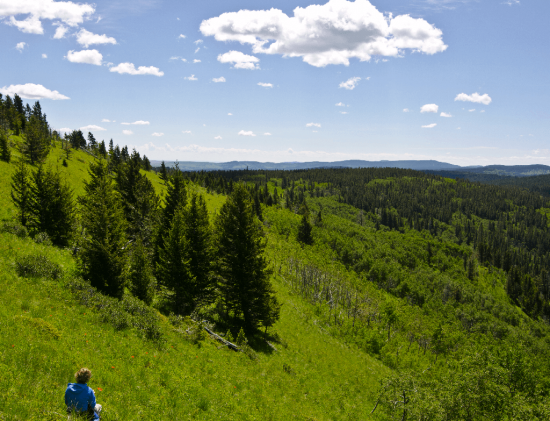 Wilderness Area – Established to “preserve and protect natural heritage while providing opportunities for non-consumptive, nature-based outdoor recreation”. Alberta has three wilderness areas – Ghost River, Siffleur and White Goat. Travel within these areas is restricted to foot access only and removal of any part of the environment (plants, rocks, fossils, etc.) is prohibited. Wildland Provincial Park – “A type of Provincial Park specifically established to preserve and protect natural heritage and provide opportunities for backcountry recreation.” Wildland Provincial Parks are typically larger landscapes with lower levels of developments. Popular activities include equestrian use, backcountry camping, hiking and fishing. Some Wildland Parks have designated trails for off-highway vehicle use. Provincial Park – Protecting both natural and cultural landscapes and features, Provincial Parks are distinguished from a Wildland Provincial Park by its greater range of outdoor recreation facilities, interpretive and educational programs, as well as generally more support facilities and infrastructure. Heritage Rangeland – To protect and preserve represent Alberta’s prairies by the continuation of cattle grazing to maintain grassland ecology, while limiting other disturbances such as industrial development. Recreational use is generally limited to foot access. Natural Area – Intended to protect special and sensitive natural landscapes of local and regional significance, while providing opportunities for education, nature appreciation, and low-intensity recreation. These areas are typically quite small and include natural and near natural landscapes. New Industrial development is not permitted. Provincial Recreation Area – Often small areas established for outdoor recreation as the primary objective, these areas support a wide range of outdoor recreation pursuits, including motorized recreation, in natural, modified, or man-made settings. Provincial Recreation Area – Often small areas established for outdoor recreation as the primary objective, these areas support a wide range of outdoor recreation pursuits, including motorized recreation, in natural, modified, or man-made settings. Generally, no new industrial development is permitted although sites are typically heavily developed for recreation use. Public Land Use Zone (formerly Forest Land Use Zone) – Designated under the Public Lands Administration Regulation, it is an area of land to which legislative controls are applied to solve specific land-use problems, and better manage conflicting land use activities in sensitive areas. Generally little/no restrictions as to the types of land uses permitted. Previously, Forest Land Use Zones (FLUZ) were administered under the Forest Act for a similar purpose. In keeping with this national and international commitment, the Government of Alberta has also committed to protecting 17 percent of Alberta’s landscape. Many of Alberta’s protected areas allow industrial development, which undermines their protection value. In addition, most provincial protected areas are small and isolated within a highly developed landscape. These areas will not support wildlife, viable ecosystems, or landscape-scale natural disturbances over time. By 2020, 17 percent of Alberta’s overall land base will be protected, with additions to the protected areas network focusing on landscapes which are currently underrepresented and provide habitat for species at risk. By 2020, the Alberta government will have identified and committed to the protection of specific areas that will achieve 17 percent protection in each of our six natural regions. In regions that are heavily developed, such as the Parkland Natural Region, Other Effective Area-Based Conservation Measures (OECMs) will need to play an important role in enhancing a government established protected areas network. While some of Alberta’s Natural Regions, like the Rocky Mountains, are relatively well protected, many of Alberta’s other Natural Regions – such as Grasslands, Parkland and Foothills – are poorly represented in the current network. A lack of representative protection has led to widespread declines in wildlife. The Grasslands Natural Region is less than 2 percent protected and more than three quarters of Alberta’s species at risk rely on prairie habitats (Alberta Environmental Protection 1997). Many of Alberta’s protected areas lack formal management plans, without which the cumulative effects of individual land-uses can diminish the wilderness values that the protected areas intended to protect. A lack of enforcement in protected areas can cause extensive damages from activities such as poaching, garbage dumping and illegal off-highway vehicle (OHV) use. Although recreation, and specifically non‐motorized recreation is indeed “critical to the quality of life we experience as Albertans” (Questions and Answers on the Proposed New Parks Legislation, 2010), Albertans also recognize that recreation is not, and should not be, the top priority within protected areas. The 2008 public survey found that 70.8% of Albertans believe the top priority for Alberta Tourism, Parks and Recreation should be to set aside more land and leaving it in an undisturbed state. Overdevelopment of facilities leading to urbanization of wilderness environments. Permitting activities which are incompatible with conservation objectives, such as the introduction of off-highway vehicles (OHVs) in areas where such use was historically prohibited. Inappropriate developments such as commercial recreation, including downhill ski operations, golf courses, and alpine villages. Overuse and overcrowding – when protected areas reach visitor carrying capacity and it is effectively impossible to manage human-wildlife conflicts.